Three runs on two home runs in the top of the ninth powered the Arkansas Razorbacks (35-20) over the Florida Gators (40-16) by a score of 7-6 on Wednesday night. 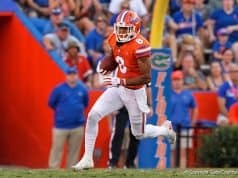 The Hogs and Gators got a late start after the game before them was delayed approximately 90 minutes due to weather. By the time the first pitch was thrown it was already 10:35 EST and we still had a four-hour game to get through. Arkansas struck first, getting to Dane Dunning in just the second inning. Dunning had previously lost his spot in the starting rotation after a string of bad starts but got the nod in the SEC opener. The sophomore cruised through the first inning, walking one and striking out two. Then, in the next frame, Dunning lost control. Back-to-back singles followed by a strike out and a walk loaded the bases. Dunning then walked and hit the next two batters, giving the Hogs a 2-0 lead. Kevin O’Sullivan had seen enough, quickly making the move to closer Taylor Lewis. Lewis gave up a sacrifice fly but retired Arkansas’ next two batters to get out of the jam. It turned out that the Gators bats wouldn’t have to do much to get on the board in the second as Arkansas starter Keaton McKinney had a meltdown of his own. McKinney walked Josh Tobias, Pete Alonso and Harrison Bader to start the frame. In his first ever at bat in the SEC Tournament, JJ Schwarz smacked a single into right field, playing two. Mike Rivera followed him, reaching on an error that scored Bader and tied the game. The Gators scored three runs on just one hit, in what would become a theme for the Razorbacks who walked six batters and hit two more. Lewis cruised through the middle innings, putting up zeros in the third, fourth and fifth innings. Florida used the momentum he created to get back on the board in the fifth. Richie Martin led off the inning with a single. Tobias walked and both runners moved up 90-feet on a wild pitch. Martin scored on Bader groundout to shortstop and Tobias touched home on a Schwarz double. Rivera made it back-to-back doubles to give Florida a 6-3 advantage. Kirby Snead replaced Lewis in the sixth inning after Lewis hit the leadoff batter. 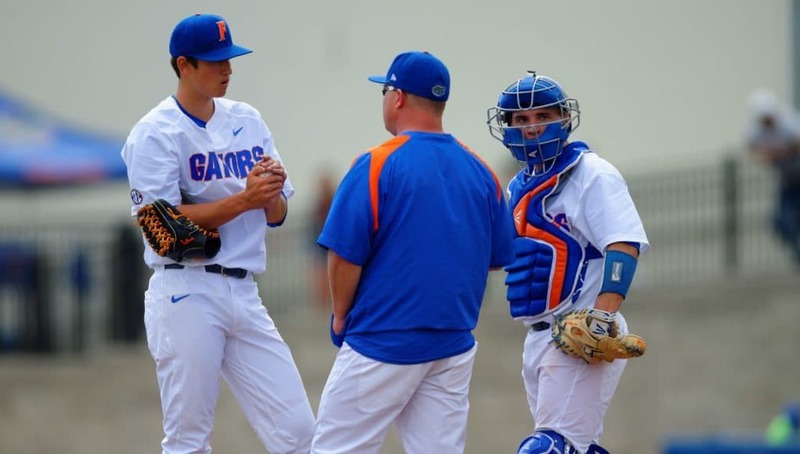 Florida’s closer threw 3.2 innings of shutout baseball, striking out four in the process. Snead worked just two batter before he was replaced by Aaron Rhodes. Rhodes intertied runners on second and third with just one out but induced two pop ups to get out of the jam. He would give up a run in the seventh inning after a leadoff triple and a one-out single back up the middle but Florida would take a 6-4 lead into the ninth inning with senior Bobby Poyner taking over on the mound. SEC Player of the Year Andrew Benintendi opened up the frame with a solo home run off of the scoreboard in right field. Poyner got a pop up for out number one before walking the next batter. Bobby Wernes made Poyner work, fouling off pitch after pitch. Pitch number 12 came into Wernes up in the zone and fat. 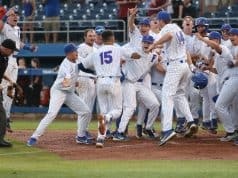 The SEC Defensive third baseman of the year barreled the ball up and threw his arms in the air, watching his no-doubt home run sail over the wall in left field well after 1 am CT.
Just like that the Gators were down. Buddy Reed would single and advance to third but pinch hitter Jeremy Vasquez struck out on a full count to end the game. 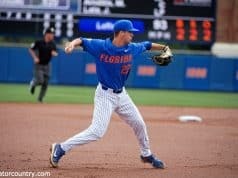 The Gators will have a quick turn around playing Auburn in the second game tomorrow with an approximate start time between noon and 1 p.m CT. Florida will likely turn to Logan Shore as they face elimination.